Considered the most turbulent and politically unforgiving year in America’s modern history, 1968 also weathered the fractious descent of The Byrds, the once-soaring folk-rock superstars who’d by that winter be reduced to just one of their five founding members, and still reeling from the abject failure of their recently-released sixth album. ‘Sweetheart Of The Rodeo’ was the product of a new band searching for a direction, and whose members wouldn’t last six months together. It was a devoted detour into the depths of country music, which neither The Byrds’ existing fans or country connoisseurs were willing to accompany them into. In the short term, it was a stepping-stone for newbie and chief instigator, Gram Parsons, to validate his country-rock vision - the pinnacle of which he wouldn’t live to see - while leaving his fellow Byrds behind to pick up the pieces, but gradually the album came to find its place as an immeasurably influential landmark recording in the decades that followed, providing a stylistic blueprint for everyone from the Eagles to Ryan Adams and the entire alt. country movement. A half-century on from its problematic and inauspicious arrival, it’s the perfect time to unravel the intricate story behind the condemned reject that became a seminal masterpiece, with the help of those who made it. Strap yourself to a tree with roots: we’re headed back to the country. A self-congratulatory milestone usually reserved for bookending a lengthy and distinguished career, it was perhaps a little premature of The Byrds to commission their ‘Greatest Hits’ in 1967 after only two years and four albums’ worth of recordings, but there was no denying the quality of the 11 tracks originally included, nor the impact each had made as an era-defining reflection of sonic and social development. 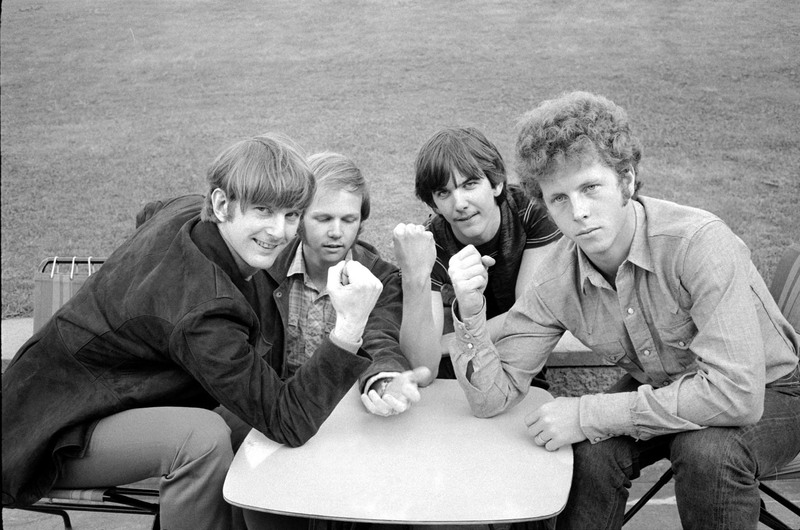 The classic Byrds line-up had coalesced at the tail end of 1964 when former bluegrass mandolin player Chris Hillman was installed as their bassist, thus completing a quintet built around the vision of Chicago-born Roger McGuinn (then known as Jim), who foresaw the end of his traditional folk career with the exhilarating advent of The Beatles, and henceforth committed himself to crafting a singular, electrified version of folk with some like minds. First to recognise this promising blend were Missouri singer-songwriter Gene Clark and Los Angeles native David Crosby, who were each drawn to McGuinn after witnessing a performance at The Troubadour in LA. As the vocal trio took flight as The Jet Set, they recruited Sunset Strip hipster Michael Clarke as drummer, before adding Hillman and rechristening themselves The Byrds. Within months they were the darlings of LA, their club residencies acting as a magnet for Hollywood’s glitterati as the Sixties began to swing, and Bob Dylan, who’d earlier gifted the group an acetate of his then-unreleased ‘Mr. Tambourine Man’. In The Byrds’ hands, the song was transformed from a lilting acoustic ballad into a radiant harbinger of the folk-rock revolution. Their version pre-dated Dylan’s own electric rebellion, while its “jingle-jangle” reference would come to define The Byrds’ chiming trademark sound, which came courtesy of McGuinn’s 12-string Rickenbacker. As documented by their first hits compilation, by 1967 The Byrds had amassed a shimmering body of work, in turn earning themselves the dubious honour of being referred to as America’s answer to The Beatles (a term they’d regularly denounce), but one which also progressed through individual talents and other diverse and innovative genres. Gene Clark dominated the songwriting efforts, while McGuinn (and, to a lesser extent, Crosby’s) contributions had ensured their earliest albums were not wholly reliant on Dylan covers. Clark’s bruised, bittersweet compositions were a reflection of his troubled soul, while McGuinn would contemplate love and enlightenment. Musically, the band embraced jazz, psychedelia, Indian ragas and country to evolve beyond any self-imposed confines - most notably, the hypnotic amalgamation of Ravi Shankar and John Coltrane influences on the futuristic-sounding 1966 single ‘Eight Miles High’, as developed by Clark, McGuinn and Crosby, established The Byrds as countercultural pioneers. By the release of ‘Greatest Hits’, Clark was no longer a Byrd. (Disillusioned with band in-fighting and overwhelmed by a fear of flying, he’d quit in early-’66. Occasional appearances with his former bandmates failed to remain permanent, and he’d pursue a credible yet unprofitable solo career until his death in 1991.) Without their lead writer, McGuinn and Crosby’s input would subsequently prosper on third album, ‘Fifth Dimension’, with “late bloomer” Chris Hillman also stepping up to the plate on its February ’67 follow-up, ‘The Notorious Byrd Brothers’. Though they’d previously covered Porter Wagoner’s ‘Satisfied Mind’ and hinted at country influences on McGuinn’s ‘Mr. Spaceman’, it was the flatpicked guitar on Hillman’s ‘Time Between’ that neatly reinforced The Byrds’ - and especially Hillman’s - affinity with the genre. “I just did what I felt and what was comfortable for me. My background was country music,” Hillman explains now, referring to his formative stints in the Scottsville Squirrel Barkers and The Hillmen - both faithfully bluegrass outfits. “That was just my comfort area that I really liked to do, so I guess I’d gradually bring [country] into the mix.” The song’s evocative lead guitar was the work of fellow bluegrass alumni and in-demand session musician Clarence White - a player who’d later loom large in The Byrds’ story. The Byrds’ ‘Greatest Hits’ enshrined their peak, a golden period of effusive energy and experimentation that was the product of contrasting yet complementary driving forces, but fate would have it serve as a bookend to the band after all. For, just two months after its release, Crosby was ousted from the band (creative differences were effectively to blame, but his rampant sense of self-worth didn’t help matters), with drummer Michael Clarke dismissed soon after. Midway through the recording of their fifth album, The Byrds had been reduced to a duo. McGuinn and Hillman were left carrying the weight. The rich and inventive sonic landscape of ‘The Notorious Byrd Brothers’ was testament to the enterprising spirit of the remaining two. McGuinn, whose grandfather was a celebrated engineer in Chicago, had fully indulged his affection for applied science in the studio: “We experimented with all kinds,” he recalls, “the Moog synthesizer and all kind of gadgets, and tape effects like backwards tapes like The Beatles had done. We were always listening to The Beatles and seeing what they did. We got into phase shifting.” The results were wondrous - the glistening nostalgia of ‘Goin’ Back’, the cosmic bridge of ‘Wasn’t Born To Follow’, the sublime otherworldliness of ‘Space Odyssey’ - but impossible to recreate on stage without reinforcements. Heightening the urgency by which The Byrds required enhancement were McGuinn’s grand ambitions for the scope of their next album. “I had this idea to do a chronological album,” he says, “a double album, starting with early music and going through baroque and classical and coming into jazz and rockabilly and hillbilly music and country music and going out into space music.” Pursuing this (or any) concept meant drafting in capable new recruits - quickly. Chris Hillman maintains the line that it was a chance meeting in a Beverly Hills bank that brought him together with Gram Parsons (who’d echo the same story), but while that encounter may have actually happened, the legitimacy of its historic significance is disputed. It’s known that Hillman and Parsons shared a manager, while Jimmi Seiter alleged to Gram’s biographer, David N. Meyer, that The Byrds had previously socialised with Gram on the LA scene. Either way, prior to his auditioning for the band, Hillman and McGuinn were certainly aware of Parsons, and his current circumstances further appealed to them. Legally bound to a preexistent recording contract, Gram reportedly couldn’t be signed up as a full-time partner, and, moreover, because of his own financial security, was not discouraged by a sideman’s salary. All things considered, in The Byrds’ search for a prospective keyboard player, Gram was a convincing candidate. His passable jazz piano enough to satisfy Roger, Gram’s next performance - a rendition of Buck Owens’ ‘Under Your Spell Again’ - would immediately win Chris over, and simultaneously insinuate at the course this latest incarnation of The Byrds were set to fly. Gram Parsons’ background is less of a story and more of a Southern Gothic melodrama. Born into the prestigious Florida-based Snively family, who dominated the state’s citrus industry, he may have grown up surrounded by wealth in neighbouring Georgia, but life was far from rosy. His father committed suicide in 1958, leaving 12-year-old Gram and his little sister at the mercy of their alcoholic mother, who’d later marry again, but succumb to cirrhosis in 1965, passing away on Gram’s graduation day. He escaped the traumas through music, first playing with local rock ‘n’ roll bands, then being swept up in the early-’60s folk revival, before finally embracing country music during his one semester at Harvard University. Signing to Lee Hazlewood Industries Records, the eponymous label of the infamous producer-svengali behind Nancy Sinatra’s ‘These Boots Are Made For Walkin’’, the group (or what was left of it, after some shake-ups) began work on their debut album in July 1967. To embellish their sound and inject some much-required country authenticity, Gram invited Jay Dee Maness to the sessions, who in turn requested Earl Poole Ball join them. Gram was an assertive commander of the album’s creation, handpicking the choice of cover material (Johnny Cash, Merle Haggard, Porter Wagoner - ‘A Satisfied Mind’ having also been previously covered by The Byrds), and writing the remainder. His lyrics had naturally developed country’s standard level of emotional suffering - ‘Luxury Liner’ decries the painful aftermath of heartbreak (“No one in this world / Could change the way I feel”), while the despair and isolation within ‘Do You Know How It Feels To Be Lonesome’ is palpable from the title alone. Musically, Gram was persevering with a sound that was genuinely respectful of country traditions yet innately contemporary within ’60s rock idioms, and though the songs themselves were perhaps a little rudimentary, there was really nothing else like them at the time. The album, to be called ‘Safe At Home’, was completed in December, and given a tentative release date of February 1968. However, before the band had the pleasure of seeing their last six months’ work coming to fruition, Gram Parsons - having entered The Byrds’ orbit and recognising the career upgrade on offer - abandoned them, relinquishing the rights to royalties and the ISB name, and leaving the fate of the album and its makers up in the air. Hillman insists that advancing the electronic adventurousness of ‘The Notorious Byrd Brothers’ was not an option, as he didn’t want to pursue it further, and claims even McGuinn’s heart was still in folk music. Roger, meanwhile, was forced to discard his notions of an anthology of American musical history in light of the others’ apathy. A solution was realised in the revived encouragement of Hillman’s first musical love. “It wasn’t a big stretch for us,” Hillman says of The Byrds going country, “it was all familiar territory. It wasn’t like having Pete Townshend and The Who do a Nashville album - that would be a stretch.” Hillman’s country credentials were indisputable, and though less obvious, McGuinn’s own affection for the genre - which he calls “a slicked-up version of folk music,” outlining the Appalachian love songs that were evolved by artists like The Carter Family and Earl Scruggs - is evident in his commitment shown on The Byrds’ earlier forays into the style, and justified by country’s endorsement by his Fab Four friends. Despite the dalliances of The Beatles and The Byrds with country music, it still wasn’t a popular genre. With forceful competition from the British Invasion, Motown, Stax, Bob Dylan, the San Fran psych scene and everything in between, country just couldn’t appeal to the love generation. “Well, if you weren’t from the South, nobody liked it,” Hillman confirms with a laugh. The first song tackled, in great Byrds tradition, came courtesy of Bob Dylan. ‘You Ain’t Going Nowhere’ had been included in a selection of demos that Dylan and The Band had been toiling away on in rural Woodstock with the purpose to provide his songs for other artists to use while he himself recuperated in seclusion from his infamous 1966 motorcycle accident. These highly productive sessions took place in the basement of the salmon-coloured home of The Band’s Richard Manuel, Garth Hudson and Rick Danko (the hundreds of recordings would collectively become known as ‘The Basement Tapes’, while the house was immortalised in The Band’s debut LP, ‘Music From Big Pink’), where Bob and The Band’s fantastical new originals were created alongside recreational run-throughs of old folk and blues rarities reeled off from Dylan’s encyclopedic memory. Birthed from such rustic and laidback scenes, the songs were infused with a pastoral charm that McGuinn and Hillman clearly identified as suitable for a country conversion. Moreover, beginning proceedings with a Dylan song would serve as a comforting bridge between The Byrds’ folk heritage and the more conventional country choices that would follow. That same day, they also put down the first of the only two original Byrds songs on the album - both of which, significantly, were written by Gram Parsons. ‘Hickory Wind’ is a hauntingly evocative eulogy to a yearning nostalgia for an idyllic youth before the encumbering burdens of fame and adulthood. It’s all the more poignantly profound when you consider Gram wrote it when he was just 21, collaborating with former ISB bandmate Bob Buchanan on a train ride in late-’67 from Chicago back to Los Angeles, where the pair holed up with guitars in a private compartment, and a conversation that bemoaned LA’s artificiality inspired its conception. Two days later, they’d rework ‘Lazy Days’, the song Gram had contributed to Roger Corman’s The Trip the previous summer. It would not make the final cut for the album, The Byrds perhaps feeling its chugging Chuck Berry-like drive was ultimately too out of step alongside its quintessentially country counterparts. It’s telling that of the first three songs recorded, two would come from and be led by the newest member of the band. “Gram Parsons seemed to be the driving force,” notes Lloyd Green. “My impressions in the studio were he had the dominant personality. When he would start talking or making suggestions, my remembrances are that Roger and Chris would kinda defer to him to some degree.” McGuinn’s authority was undisputed, but in endeavoring to prevail with credibility in the genre, he’d turn to Gram for direction. “Yeah, I was happy with his knowledge of country music,” Roger accedes. The third session, on March 12th, saw McGuinn revisit his folk roots, bringing to the table Woody Guthrie’s protest song, ‘Pretty Boy Floyd’. Though it details the life of the notorious 1930s bank robber, the intent of Guthrie’s narrative is to take aim at the financial institutions Floyd targeted, who’d ruined many more lives during the Depression era than the outlaw ever did. The Byrds’ version translates Guthrie’s acoustic accompaniment into a perky bluegrass number, and is a rousing showcase for John Hartford, whose banjo and fiddle lines supply its nimbleness. Chris Hillman was prominent across the two songs that were captured on March 13th. He and McGuinn had set the arrangement for Roger’s rendition of ‘Pretty Polly’, a traditional English murder ballad that can be traced back to the 18th century. The guitar on this song is remarkable in that it’s undoubtedly country and yet, in all its scintillating glory, it’s unmistakably Roger McGuinn. Nevertheless, ‘Pretty Polly’ would be passed over for inclusion on the record. An old bluegrass favourite, ‘I Am A Pilgrim’ was chosen by Hillman as an opportunity to take centre stage and was recorded that same day. Stripped down to just banjo, fiddle and acoustic guitar, it’s resolutely old-time, Hillman’s sweet and uncorrupted vocals perfectly manifesting the song’s gospel perseverance. Columbia Records had insisted that while in Nashville, The Byrds should pay a visit to WSM radio, where Ralph Emery, the most prominent country music DJ in America, would interview them on his show. So, on the night of the 13th, the group - with Lloyd Green, an acquaintance of Emery’s, in tow - duly met the renowned presenter, and were presently shocked when he unleashed on air a scathing attack on what he saw as a pack of intruders intent on dishonouring country music. Bruised by the confrontation, the group nonetheless reconvened the following day for their penultimate Nashville recording session. On the cards on the 14th was ‘You Got A Reputation’, a song by the folk singer Tim Hardin, which had been in Gram’s repertoire for a couple of years. Aside from some rich slide guitar, there are very little country elements to this version - a reaction, maybe, to the previous night’s conflict - which may explain why it too was omitted from the final tracklisting. March 15th had started positively. During the day, The Byrds completed work on another pick from Dylan’s basement output. The demo for ‘Nothing Was Delivered’ was slow and foreboding, propelled by Richard Manuel’s piano and enriched by Garth Hudson’s swirling organ, but after being interpreted by The Byrds, it became a rippling country shuffle, with McGuinn’s lead vocals a somewhat more comforting counter to Dylan’s scowling tone on the original, despite the song’s disturbing theme. In the evening, The Byrds were thrilled to learn that Columbia had arranged for them to perform on the legendary Grand Ole Opry. A country music institution, the weekly show was held in Nashville’s venerable Ryman Auditorium, and broadcast live on WSM. Its stage had welcomed the genre’s greatest stars, including Hank Williams, Bill Monroe, Patsy Cline, Roy Acuff, Johnny Cash and, just once, a young Elvis Presley. It was indeed an honour for The Byrds to be considered for inclusion - they were the very first rock band to receive the honour - and, taking the engagement seriously, decided to dress appropriately for the occasion. Master of ceremonies that night was Tompall Glaser, an established country star who’d later form part of the outlaw movement alongside Waylon Jennings, Willie Nelson and Johnny Cash. He had been informed that The Byrds were going to perform two Merle Haggard covers - ‘Sing Me Back Home’ and ‘Life In Prison’. After introducing the first, Glaser returned at its conclusion, thanked them, and announced the second. Caught up in the spirit of his surroundings, Gram - a lifelong listener of the Opry - decided he was going to take this moment to fulfill his dream of becoming a country star and, taking to the mic, responded: ‘No, we’re going to do a song for my grandmother,” and counted his oblivious bandmates into ‘Hickory Wind’. Glaser was incensed. Still, it was a disheartening end to their stay in Nashville, and signs of doubt surrounding the project were still visible a couple of weeks later when McGuinn suggested to a reporter that only half of the ensuing album would be pure country - his proposed space-rock anthology would complete the flipside, apparently. While The Byrds were on a short tour of the East Coast, Lee Hazlewood finally released the International Submarine Band’s debut, ‘Safe At Home’. Knowing there was no existing entity to market, Hazlewood invested in little promotion for the album, and though it received some critical acclaim at the time, it died a death on the charts. Even Gram’s association with The Byrds couldn’t save ‘Safe At Home’ - not that he ever publicly reacted to its release - but even a third dissenting blow couldn’t convince him that country was not the way forward as album sessions resumed in Los Angeles. In the week that ‘You Ain’t Going Nowhere’ was released as a teaser single (it would only reach 75 on the US charts), The Byrds relocated to the more familiar territory of Columbia Studios in Hollywood, this time bringing along - at Gram’s behest - pedal steel player Jay Dee Maness, who’d in turn invite pianist Earl Poole Ball, both of whom having impressed on their ISB sessions. It was over a week later when they’d reassemble (with Clarence White providing additional guitars) to record ‘You Don’t Miss Your Water’, accentuating the country components to William Bell’s 1961 Southern soul hit. Written with a longing for home and his girlfriend back in Memphis while on tour in New York, Bell’s ballad is tangibly plaintive - four years later, Bell’s Stax labelmate Otis Redding would further expose its potently expressive core on his classic LP, ‘Otis Blue’. “Gram certainly understood the Southern synergy between soul and country ballads, which invariably shared 6/8 gospel time signatures,” the author would tell Clash directly, signifying his reworks of James Carr’s ‘Dark End Of The Street’ and Aretha Franklin’s ‘Do Right Woman, Do Right Man’ that would follow in later years as evidence of his continued appreciation of the stimulating hybrid genre. On April 17th, they met again to cut ‘You’re Still On My Mind’, a song by cult rockabilly singer Luke McDaniel. An associate of both Hank Williams and Elvis Presley, McDaniel’s career was short-lived, gaining more fame from the covers of his songs than his own recordings, and later giving up music entirely in favour of the more dependable trucking business. Once again featuring twin takes for lead vocals from Gram and Roger, the instrumental track itself, Jay Dee claims, proved problematic. Bearing all the expected trademarks of a typical country song - heartbreak, hard drinking, and hopelessness - ‘You’re Still On My Mind’ is wonderfully despondent yet - due largely to Jay Dee’s spirited steel and Earl’s twinkling honky-tonk piano - contrarily buoyant. Another relatively productive day, on April 24th The Byrds managed to record two songs within their studio visit. ‘The Christian Life’ came from the songbook of The Louvin Brothers, a fervently old-time duo whose close harmonies surely appealed to McGuinn’s fondness for entwined vocals. Their songs were permeated by the gospel darkness of the Baptist church - titles such as ‘Satan Is Real’, ‘Are You Afraid To Die’ and ‘Are You Washed In The Blood?’ attesting to their devout faith. Chris Hillman helmed ‘Blue Canadian Rockies’, succeeding Gene Autry, who made Cindy Walker’s song famous in a film of the same name. “I always loved that song in its simplicity and beauty,” he told JamBands.com earlier this year. Indeed, his sweet and contemplative voice lends itself perfectly here to the forlorn hankering for a faraway love. Nearing the end of their recording obligations, The Byrds made the curious decision on May 1st to develop an original contribution from drummer Kevin Kelley. Both musically and lyrically, ‘All I Have Is Memories’ is comparatively lightweight; a pleasant country shuffle beat carries an airy tale of desolation, and while Kelley’s voice is capable and likeable enough, it has little of the rural substance that Hillman, McGuinn and especially Parsons could effortlessly imbue a song with. All of which is likely the reason it would ultimately be left off the album. It was a change of scene the next day, as The Byrds touched down in Europe for a select handful of dates. Parsons had harangued McGuinn to bring a pedal steel player for these shows, but he refused, instead acquiescing to invite banjoist/guitarist Doug Dillard, who’d recently been playing with ex-Byrd Gene Clark. Of the 10 songs they played at The Piper Club in Rome that night (and upon their return five days later), four would be drawn from the new album’s shortlist of recordings, while only two would feature Gram as the lead singer - McGuinn’s prevailing assertion of leadership manifest on stage. Naturally, the crowds were more receptive to the older, familiar numbers such as ‘I’ll Feel A Whole Lot Better’, although they may have been unprepared for the rather jarring banjo that somewhat mitigated that song’s usually radiant jangliness. Present at their gig in London’s Middle Earth club that week were two members of British rock royalty The Rolling Stones. Mick Jagger and Keith Richards had come to lend their support to old friends McGuinn and Hillman, and though they knew nothing of the newest members, after the show they spontaneously suggested that everyone should bundle into their limousine for an impromptu visit to Stonehenge. Joining them on the three-hour ride were the Stones’ respective girlfriends, Marianne Faithfull and Anita Pallenberg, and photographer Michael Cooper - not to mention copious amounts of Johnnie Walker Red and other such necessities to take their minds off the long journey. During the trip, Mick and Keith were derisive of The Byrds’ acceptance to play South Africa that coming July. McGuinn had been friends with South African singer and apartheid activist Miriam Makeba, and she’d appealed to him that if The Byrds ever had the chance to play in the country, they should take it. Curious as to how his group might help the cause as cultural missionaries, when the offer came in, he approved it. The group were unaware that the British Musicians Union were threatening a ban on any overseas musicians that played South Africa, and while the Stones cautioned against the tour, McGuinn seemed intent on fulfilling his promise. Gram, meanwhile, appeared to listen attentively to their every word - his bandmates since commenting on his being conspicuously starstruck throughout the excursion. In their first constructive instance of real collaboration, McGuinn and Parsons wrote a new song together in London. ‘Drug Store Truck Drivin’ Man’ was a caustic and satirical swipe at a redneck radio DJ, plainly inspired by their contemptuous treatment from Ralph Emery in Nashville and the evidently still-fresh wounds. It’s at once harshly critical of Emery (“He’s a fireman’s friend, he’s an all-night DJ / But he sure does think different from the records he plays”) while defensive of The Byrds’ motives (“I’m an all-night musician in a rock ‘n’ roll band / And why he don’t like me I can’t understand”). Though it wouldn’t make ‘Sweetheart Of The Rodeo’, Roger would include it on the follow-up, ‘Dr. Byrds & Mr. Hyde’, while Gram would often perform it live. Emery naturally wasn’t best pleased at the dubious honour, and threatened legal action against the band. Though he’d remain prickly on the issue throughout the years, he and McGuinn did seem to be on better terms by the Eighties, when Roger was interviewed on Ralph’s TV show. Back in LA, one final song was conceived for inclusion on the album. Another Parsons composition, ‘One Hundred Years From Now’, is an enduring and thoughtful consideration of the transience of social judgement, one that posits a bleak future if people don’t learn to adjust their attitudes. Before anyone could celebrate the completion of recording, a huge and unavoidable problem arose that would, in the short-term, prove polemical and cruel, and in the long-term form the basis of distrust and animosity that would linger for years to come. Finally wreaking retribution for the investment he’d squandered on the International Submarine Band, Lee Hazlewood had opened legal proceedings on Columbia Records, pronouncing Gram Parsons to still be under contract to him, and therefore was not permitted to appear on recordings for anyone else. It is said that Columbia decreed to The Byrds that Gram’s vocals would have to be removed from the latest batch of recordings. Breaking up the long haul from LA to South Africa, The Byrds made a scheduled stopover in London in the first week of July 1968. They co-headlined (with The Move) a charity gig at the eminent Royal Albert Hall on the 7th to an elated and responsive audience that included Jimi Hendrix, John Lennon, George Harrison, Brian Jones, Mick Jagger, and Keith Richards. The Stones would once again hook up with The Byrds after their show, where the burning topic of South Africa was quick to surface. The controversy would play on Gram’s mind that night, as he wrestled with other grievances that had rankled over the last few weeks. An inflated ego was surely to blame. Gram’s rise to pop’s upper echelons had been accelerated, and his unbridled charisma was barely contained in the confines of the outfit he was supposed to be wholly committed to. He felt he was owed more. It’s reported that Gram had once suggested separate billing (i.e. The Byrds featuring Gram Parsons), and that he had pressed for a higher wage, although McGuinn refutes the latter. His agenda, The Byrds learned, was to maintain the ascent he had put in motion, but while his - in his eyes - obstinate bandmates ensured his attempts at dominance would be kept in check (their priority was the future and welfare of the group, not the individual), there wasn’t much room for him to maneuver. The Byrds, Gram felt, did not appreciate him - the fact his name was misspelled as ‘Grahm’ in the Royal Albert Hall programme could only have exacerbated his displeasure. Gram felt an affinity with Keith Richards, the pair bonding instantly over country music and the sound of the South, while the Byrd was undoubtedly enraptured by the Stone, bewitched by his power and prestige. Waking the morning after the London show with the words of warning on South Africa reverberating around his head, Gram was convinced he had the perfect excuse with which to drop a bombshell on his group. As The Byrds packed their luggage into the waiting transport outside the hotel that was to take them to the airport, Gram informed them that due to his conscience and the political climate in South Africa, he would not be accompanying them on this tour. To add insult to injury, at the culmination of this unmitigated disaster, the promoter robbed The Byrds of their fee. Beaten and worn out, they retreated to Los Angeles, where imminent dates required a more proficient and permanent guitarist in the ranks. On August 30th 1968, the product of the previous six months’ work arrived on sale in the form of ‘Sweetheart Of The Rodeo’. Its cover - a detail from artist Jo Mora’s 1933 print, The Evolution Of The Cowboy - hinted at the contents within, but few Byrds fans could have guessed just how drastically country the group had turned. That the song selection spanned bluegrass, folk, gospel, soul, country and Bob Dylan was in part a realisation of McGuinn’s original concept of a musical anthology, and as Hillman and Parsons gleefully indulged themselves in their most beloved of genres, it was, to some degree, a success in the eyes of their creators. Yet to the public, it was an incredibly divisive release, representing a stylistic shift that nobody had quite been prepared for. “It was a disappointment to many of our rock and roll fans, and country people didn’t accept it because we’d come from a rock and roll background,” McGuinn explains. “I was disappointed, and a bit surprised, because we loved the music so much we wanted to honour the music, and it got flak from both the country people and the rock and roll people at the same time - nobody liked it!” he laughs, bittersweetly. ‘Sweetheart Of The Rodeo’ became the lowest-selling Byrds album to date, stalling at number 75 in the US Billboard charts, and 45 in the UK. The group had followed an outlandish muse, trusted their instincts, and devoted themselves entirely to the cause, and while it had been a brave and risky experiment, it just failed to be accepted by an audience expectant of something completely different. The collective that had conceived it were no longer intact, and further changes were afoot as the fallout from ‘Sweetheart…’ worsened. Kevin Kelley, Clarence White complained, was not a capable enough drummer to complement his advanced style of playing, and the guitarist campaigned for him to be replaced by Gene Parsons (no relation to Gram), who’d played with White in their own outfit, Nashville West. Having auditioned Parsons and compared his musicianship to Kelley’s, McGuinn and Hillman agreed to hire him. It’s interesting to note that within a couple of months Clarence White had succeeded in ameliorating The Byrds with his own recommendations, whereas Gram Parsons had consistently been met with refusals and arguments when attempting the same. Chris Hillman was tasked with firing his cousin that September. It was the last notable achievement Kelley would have in the industry; he withdrew from session work in the early-’70s and appeared to leave the music scene for good. He died in 2002 of natural causes. As 1968 turned into 1969, the splintered architects of ‘Sweetheart Of The Rodeo’ began to pick up the pieces and start afresh, though each would develop and evolve the basic tenets that had been explored during the making of the album that broke them. The Burritos, which also featured ex-Byrd Michael Clarke on drums - recorded two albums in their first formation, ‘The Gilded Palace Of Sin’ in 1969 and ‘Burrito Deluxe’ in 1970. Though not commercial successes in their time, those albums - alongside ‘Sweetheart Of The Rodeo’ - have become the embryonic foundations upon which country rock was built. The songs that Gram and Chris crafted together fused perfectly the disparate elements of country, rock and soul, and reflected the rebellious spirit of late-’60s LA in its attitudes. Songs like ‘Sin City’, ‘Hot Burrito #1’, ‘Hot Burrito #2’, and ‘Older Guys’ were evocative and resonant snapshots by a group flowering in a nascent sense of innovation. After the Burritos, Gram Parsons ventured forth as a solo artist, releasing two albums under his own name that realigned with a more traditional country sound. His debut, ‘GP’, came out in January 1973, and introduced the stunning vocal sounds of Emmylou Harris, a singer Chris Hillman had discovered and recommended to Gram as a duettist. Its follow-up was completed in September 1973, and to celebrate the end of its production, Gram took a trip to the Joshua Tree in the Californian desert. On the evening of September 18th, Gram died from an accidental overdose of liquid morphine. He was 26. Neither of Gram’s solo albums made much of a commercial impact (‘Grievous Angel’ was released posthumously in January 1974), but his critical appraisals endured, and as the mystique surrounding his early death and the cult around it grew, more interest would develop in him and all the music he created in his lifetime in years to come. Now regarded as a seminal visionary of country rock - or ‘Cosmic American Music,’ as he called it - his legacy is crystallized and remains a reference point for many; Emmylou Harris, especially, sustains her role as a torchbearer for her mentor’s gifts to the world. After leaving the Flying Burrito Brothers in late-1971, Chris Hillman first joined Stephen Stills’ eclectic and brilliant band, Manassas, staying for two years and contributing songs to both their albums. A very short-lived reunion of The Byrds’ original line-up produced just one album before Hillman teamed up with ex-Buffalo Springfield guitarist Richie Furay and J.D. Souther, a noted country rock songwriter, to form the Souther-Hillman-Furay Band, who also dissolved after a couple of albums. In the mid-’80s, after two solo albums and a brief collaboration with Roger McGuinn and Gene Clark, Hillman founded the Desert Rose Band after re-embracing his bluegrass roots. “I think that was the best thing he ever did,” McGuinn says of his friend’s group, who released five albums and still occasionally perform today. From 1969 to 1972, The Byrds prospered as a proficient and profitable live act, their unit consolidated with sharper musicianship. Releases during that time were somewhat less successful; ‘Dr. Byrds And Mr. Hyde’ actually sold less than ‘Sweetheart Of The Rodeo’, while 1971’s ‘Byrdmaniax’ suffered under the extraneous overdubs of producer Terry Melcher, and its hastily-recorded follow-up, ‘Farther Along’, justly sounded rushed. Only ‘(Untitled)’, the 1970 live album, sought to capture the natural essence of the stage-hardened group in that time. McGuinn chose to disband this line-up at the close of 1972. Sadly, Clarence White died in July 1973, the victim of a drunk driver. Following the ill-fated Byrds reunion that year, McGuinn stepped out as a solo artist, a role he has thrived in to this day. 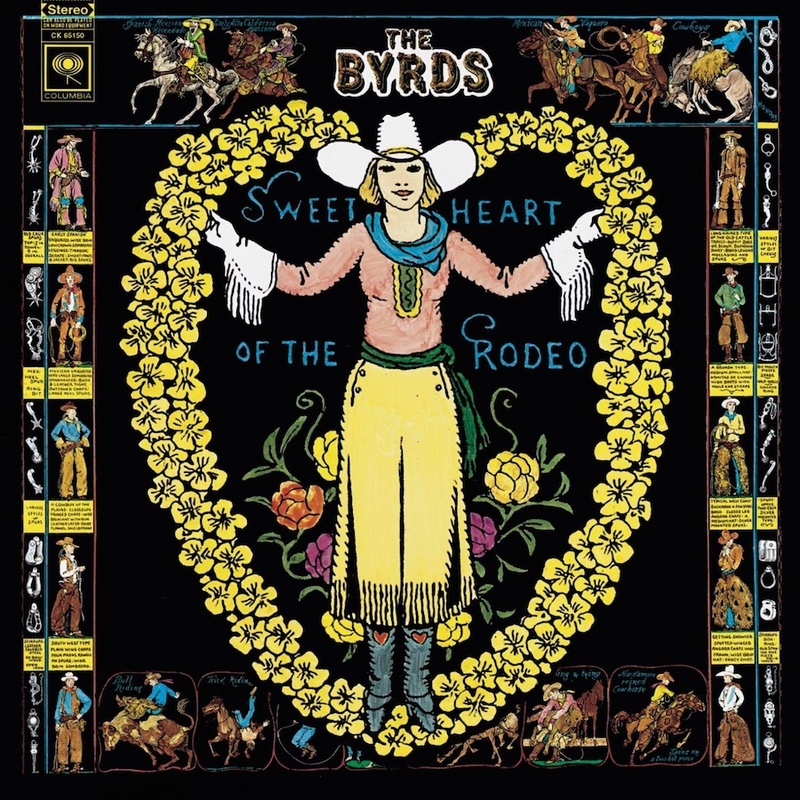 ‘Sweetheart Of The Rodeo’ was a casualty of innovation; The Byrds may have opened the door to country rock, but it was those who followed in their footsteps that truly triumphed in the genre. Just as The Byrds, Chris Hillman and Gram Parsons persisted in that direction, so too did a wave of artists and bands who’d used ‘Sweetheart…’ as a blueprint. Gram’s impact on Keith Richards was felt in The Rolling Stones’ louche country on ‘Exile On Main Street’, while acts like Neil Young, Bob Dylan, Poco, and The Dillards progressed the burgeoning genre. Conversely, it also drew the rock elements further out of established country stars - Johnny Cash, Willie Nelson, Waylon Jennings and Kris Kristofferson headed up the outlaw country movement, endearing themselves to a younger, more rebellious audience. “It validated our position,” says McGuinn of the country rock movement that swelled in the immediate wake of ‘Sweetheart…’ As it developed and permeated the mainstream in subsequent decades, the worlds of country and rock music would constantly be integrated. The pastoral leanings of Bruce Springsteen and John Mellencamp in the ’80s gave way to the alt. country movement of the ’90s, which redefined Americana to a new generation. It was spearheaded by Uncle Tupelo, who’d eventually splinter into Son Volt and Wilco, and counted among its devotees The Jayhawks, The Bottle Rockets, Calexico, Lambchop, My Morning Jacket, and Whiskeytown, which spawned the solo career of lead singer Ryan Adams, who’d go so far as inviting Emmylou Harris to sing with him on his first solo album. In its golden anniversary year, ‘Sweetheart Of The Rodeo’ is more celebrated than ever, and is enjoying a revitalised interest due to the tributes being paid from those who made it. This June, Roger McGuinn and Chris Hillman announced that they were reuniting (fortified by Marty Stuart and his Fabulous Superlatives) to tour together, presenting ‘Sweetheart…’ in its entirety, alongside songs that inspired The Byrds’ postcard from Nashville. The dates have so far yielded fantastic and glorious acclaim, and are set to continue through to 2019. Meanwhile, those whose DNA flowed through the album’s grooves still find it permeating their present, 50 years later. Earl Poole Ball now lives and performs in Austin, Texas, regularly fielding requests for the songs he famously provided piano for, and signing copies of the album. “When I first moved here the buzz around town, people told me, was not that I had played with Johnny Cash for 20 years, but that I had recorded on ‘Sweetheart Of The Rodeo’,” he laughs. Jay Dee Maness and Lloyd Green have teamed up to create a new album, ‘Journey To The Beginning: A Steel Guitar Tribute To The Byrds’. The lovingly crafted homage finds the pair translating the whole of ‘Sweetheart…’ as an instrumental showcase of their respective steel guitar talents, as well as the timeless musicality of the album itself, which understandably figures large in their affections. In this age of cultural homogeneity where monopolies of producers operate a factory line of hits and careers are mercilessly cut short for taking a wrong turn, it may be difficult to appreciate the obliviousness and optimism of the four Byrds who sought simply to step outside of expectations and try something a little different, the widespread disapproval they caused, and the ignominy they experienced as a result, but it’s clear to see that the music world owes a debt of gratitude to their endeavors. The curse of ‘Sweetheart Of The Rodeo’ may have fragmented its makers and in turn tainted its virtues for all involved, but without their defeat and implosion we may never have enjoyed the noble and joyous missteps that many bold artists have made since. Misaligned and misunderstood for being ahead of its time, as the resplendent gem reaches a half-century, it finally stands as a fearless measure of audacity, integrity and ingenuity - which, really, is exactly what The Byrds set out to achieve. The 50th Anniversary Tour of ‘Sweetheart Of The Rodeo’ with Roger McGuinn, Chris Hillman, Marty Stuart and his Fabulous Superlatives is playing US dates until March 2019. For more information, see Roger’s Facebook, or Chris’ website. ‘Journey To The Beginning: A Steel Guitar Tribute To The Byrds’ by Lloyd Green and Jay Dee Maness is available to stream and download now on iTunes. Earl Poole Ball plays the Continental Club in Austin, Texas, most Sundays, and performs regularly. See his website for full performance listings.